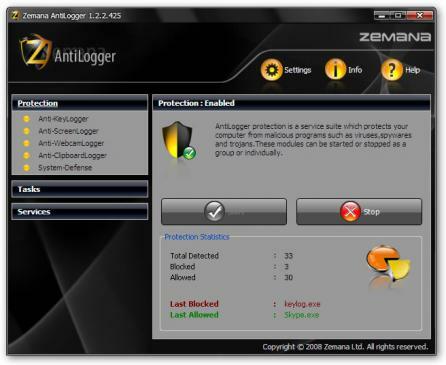 Zemana AntiLogger is a robust collection of security tools created to prevent information theft. The program is not an antivirus, but it can seamlessly work in conjunction with one. Its purpose it to detect any kind of application that might attempt to steal your data such as keyloggers, clipboard loggers, webcam loggers and others. Real time protection is provided through the System Defense Module and you can create custom rules for your trusted apps to avoid false positives. From Zemana AntiLogger’s Settings menu you can change the app’s security options, but also how it receives updates. However, beginner have no need to worry about customizing these settings since the program runs perfectly with the default values.